Last month at Google I/O Google unveiled the new Chromebooks from Acer and Samsung. We've teamed up with the folks at Google to offer you the chance to win one of three Chromebooks from Google. The new machine features Google's new browser-based Chrome OS – all your details and apps are stored in the cloud so you'll never be without your files or settings. Google has worked with their expert puzzle master to design a puzzle that should keep you busy for a while. If you're up to the challenge and are one of the first three to come up with the correct solution, you can win a new Chromebook! It's pretty tricky, though, so follow us on Twitter for some helpful hints and clues over the next couple of days. 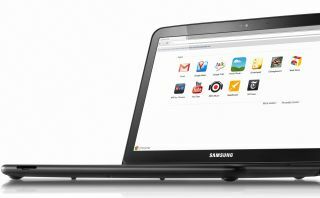 The Samsung Chromebook 5 series has a UK release date of 1 July, but you can pre-order it already - it's priced at £399 for the 3G version and £349 for the Wi-Fi only flavour. Note that this is only available to UK residents and you have to be 18 years or older to enter. Please see the Official Rules.